Sadly, I've never mentioned S on the blog before, even though he was a major part of my life. As a child I wanted a dog so badly, and my 11 year-old-self convinced my parents I was responsible by reading every dog book I could find and memorizing the ~200 dog breeds recognized by the AKC. I fell in love the with American Eskimo; Dad found a local newspaper ad for American Eskimo puppies, and we drove to visit the breeder. From a pile of white fluffy puppies, S crawled toward me, and he became mine. He came with us shortly after Christmas; the very first night, we had Chinese roast duck for dinner. Afterwards, we heard a rustle by the trash and discovered S stealing our duck bones! Mom joked he was definitely was an "Uy". 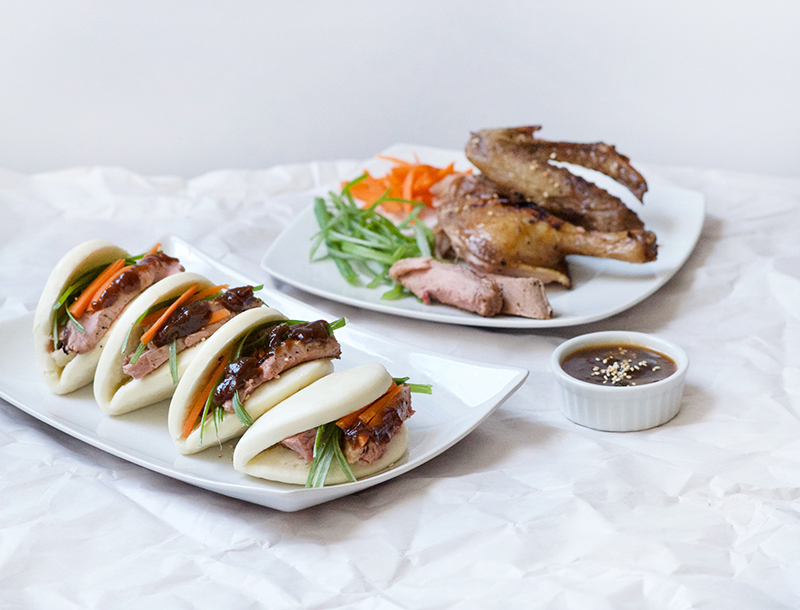 And thus Roast/Peking Duck became one of his favorite foods. S was super smart and very food motivated. He loved fortune cookies, our official treat for training him. Like most Spitz dogs, he was aloof with strangers but devoted to us, never a lapdog, but always content to lie by our feet and have his ears scratched. Despite our chaotic schedules, he became housetrained with an iron bladder - his bladder holding up to 14 hrs (FYI this is not recommended) -and he had free roam of the house, somehow knowing not to go upstairs or go on any furniture without us ever teaching him. He had stunning white fur, looked like a small Arctic wolf, and we became known in the neighborhood as "The neighbors with the White Dog." Though he came from an ad off the newspaper from random breeders in rural Texas, with no famous bloodlines or papers, and cost a mere $125, we lucked out incredibly with his excellent health, good temperament, and amazing purebred American Eskimo looks. Nearly 16 years later, S had slowed down greatly, particularly from arthritis and incontinence - the whole family fretted about his health and doted on him. He lived at home with my parents, who were empty nesters for the first time ever, save for S.
I feared he wouldn't last much longer, so I booked plane tickets back home to see him and say goodbye on my next vacation block. His health would have periods of ups and downs, yet he steadily chugged along, always excited for the next treat and ear scratches. My vacation block was coming up next, and I was so looking forward to seeing him, but I got the dreaded news a few days ago - S was declining acutely. He was so weak/sick he could barely move, kept panting/coughing, and he wasn't drinking anymore. Through the past 6 months, I had debated how/when I would know it was Time; at that point, we all knew it was Time. In his last days, I video called frequently, and my parents sent the family text thread constant updates, photos, and videos. We, of course, fed him his favorite dish - Roast Duck, as much as he wanted. I was dejected as I wouldn't make it back home in time, but videocalled in to be with him as he left for home the last time and again at the vet, as he was put to sleep. And that was that - my parents drove back home alone to a house that was the quietest and emptiest it had been in 16 years. My brother told me I needed to make a recipe for S and draw a doodle of him. 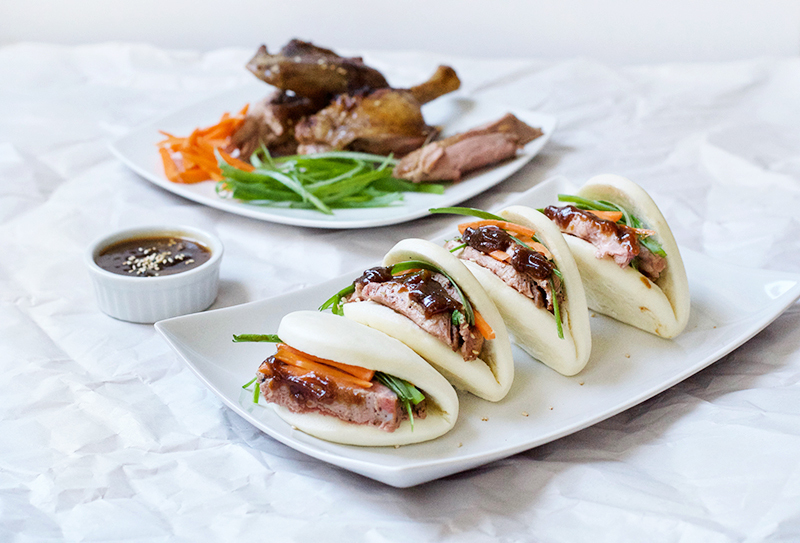 I've always associated Roast/Peking Duck (and fortune cookies) with S, so here is my Roast Duck Bao recipe, adapted from Tyler Florence in Food Network. 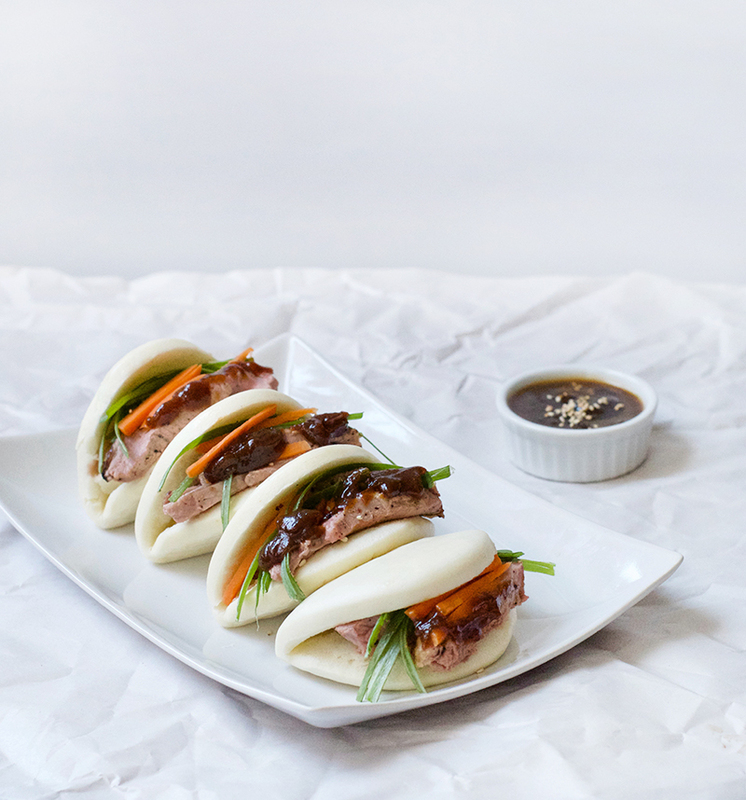 You loved peking duck and fortune cookies; you stole tomatoes from our garden and slippers from our feet. You were guardian of the house and official welcome-back-home greeter. You had the fluffiest white fur, and even as you aged, remained the most beautiful and smartest dog I'd ever met. You're been with me more than half my life. My regret is not having photos of you, as alas, the age of Facebook, smartphones, and Instagram was nonexistent 16 years ago. ROAST DUCK: Rinse the duck and dry thoroughly with paper towels. Rub chinese five-spice, sugar, and salt all over the duck. Stuff the duck cavity with ginger, garlic, and onion. Tie the duck (use this video as a tutorial for trussing poultry - using floss!). Place a large pot on the stovetop (big enough to fit the duck) and fill with 2-inches of water, turn the heat to medium. Set a rack insert inside the pan (I don't have a rack so I propped my duck above the water with ramekins) and lay the duck, breast-side up. Steam the duck for 45 minutes, checking the water level periodically. Steaming the duck first melts away some of the fat and shrinks the skin. Combine the vinegar, honey, and soy sauce in a small bowl (microwave to melt the honey). Place your duck on a rack on top of a baking tray lined with foil. 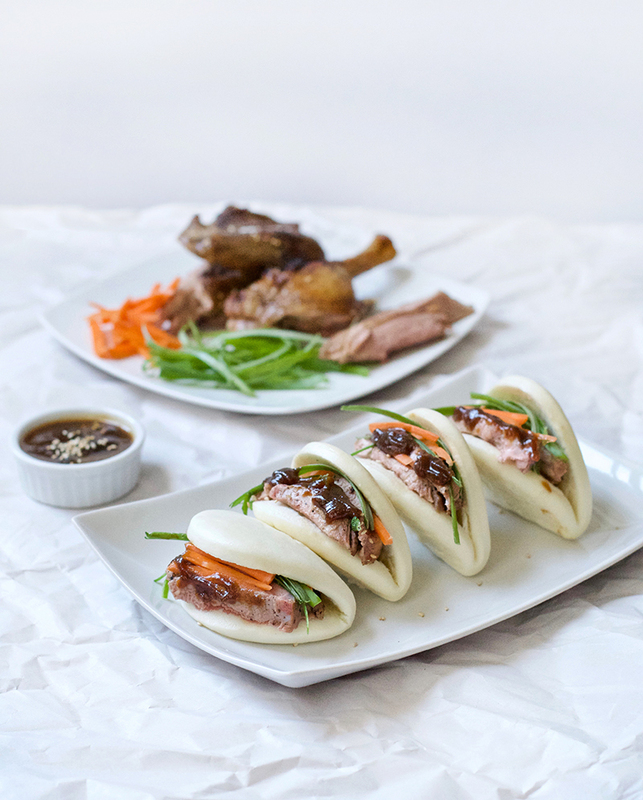 Glaze the duck with half the sauce. Roast the whole duck for 40 min, basting periodically with remaining glaze to set in a deep mahogany color. You can cover the breast with some foil if it gets too dark. Broil the duck for the last 5 min to crisp the skin (watch carefully). I'm heart broken too my love. He had a good run and provided you all with so many memories that you'll always cherish. I've never tried making anything with Ahh, this used to be one of my favorite things ever! (If I'm to be really honest, it still is, but I haven't been able to eat duck since I got pet ducklings a couple years back. x_x) These look absolutely amazing though! Don't tell my duckies. ._. my heart breaks for you, natalie! i'm happy s had such a good life but so sorry for your loss too. what a sweet homage to him. I'm so sorry for your loss. This was a lovely tribute to him. ...Your recipe looks amazing! Aww. I am so sorry to hear about the loss of your sweet dog. Thank you so much for sharing. Oh this sounds so delicious! Adding it to the top of my list of recipes to try! omgosh.... these look so divine!! 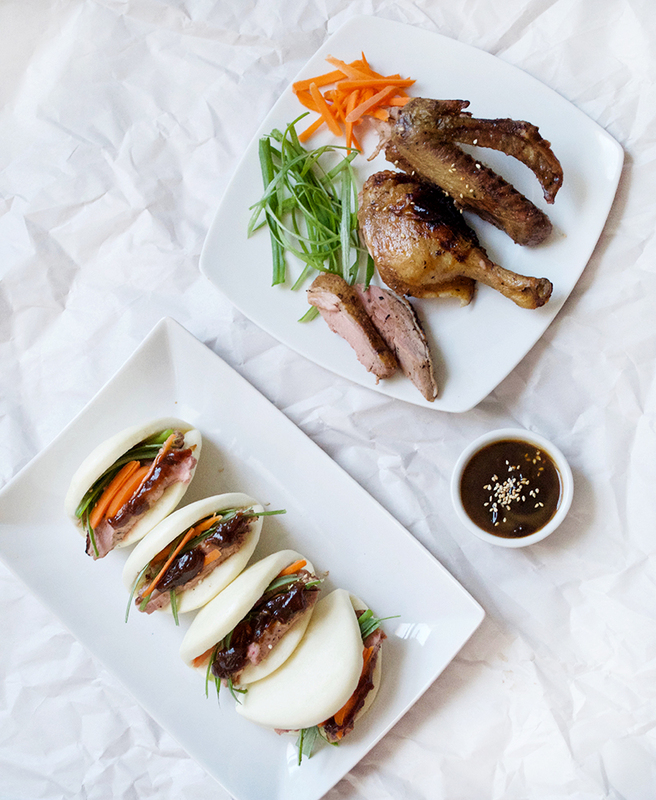 Duck + Bao .... YES PLEASE!! I have never tried to do anything with these buns but I love them! That looks amazing!! I’ve gotta try this! I literally just came back from a BBQ restaurant where I ate a feast and this made me hungry again!!! Drooling! I've never had duck before, but this looks so tender and juicy! Some delicious comfort food right here! I'm so sorry for your loss; we lost our dog 6 months ago and it's just devastating. Even though you know it's the right thing to do because they'll no longer be in pain, it's so painful. 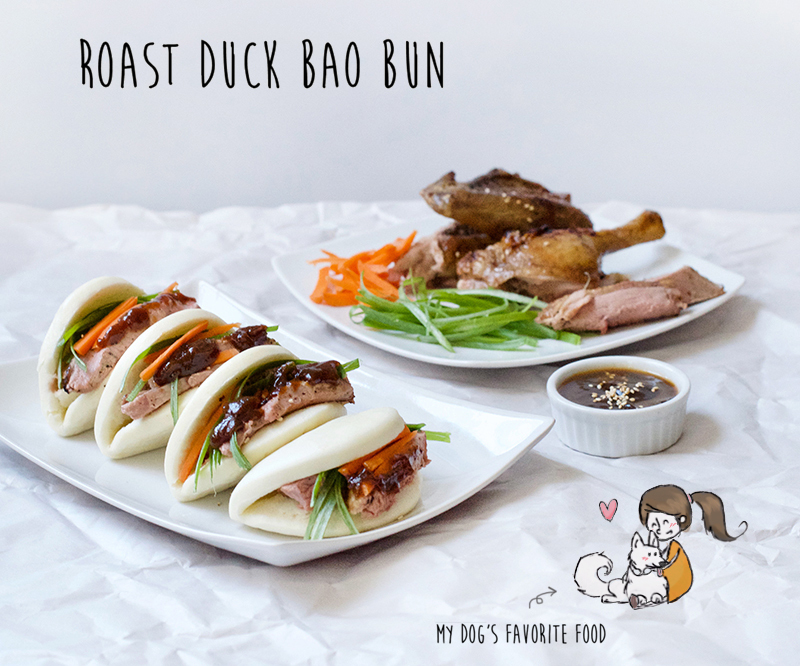 I guess grief is the price we pay for love :( This recipe is the perfect way to celebrate his life; I'm sure he's up there running around and eating plenty of duck!